Buckwheat, also known as French Wheat and Beechwheat, is native to Central Asia but found its way to Europe via the Crusades. The plant eventually traveled to North America, where it was largely cultivated as a forage crop for pheasants. The herb continues to be cultivated today as food for bees, which produce a dark and robustly flavored honey in return. Although the herbaceous plant is still grown as a grain, the three-sided rind that covers the nut or seed is also harvested for use as upholstery filler. For people with allergies or sensitivities to synthetic materials used for this purpose, buckwheat hulls are an attractive alternative. Buckwheat produces a fruit referred to as an achene, which means it contains a single seed that doesn't open at maturity. Although the name of the plant implies it is a cereal grain like wheat, it isn't; it's a member of the Polygonaceae family of flowering plants that includes rhubarb and sorrel. Buckwheat hulls are the hard outer shells that house the seeds of buckwheat grain. The hulls are strong, aromatic and do not retain or reflect heat. This introduced annual plant is ½–2½' tall, branching occasionally. It is more or less erect, but has a tendency to sprawl. The stems become ribbed and reddish green with maturity; otherwise they are light green and round. The alternate leaves are up to 4" long and 3" across. They are sagitate or cordate, indented at the base, and often tapering abruptly above the middle. Their margins are smooth or slightly undulate. The lower leaves have slender petioles, while the upper leaves are sessile. Usually, neither the stems nor the leaves are hairy, although the upper stems are hairy on some cultivars. One or two racemes of flowers develop from the axils of the upper leaves; some of these racemes may be terminal. These racemes are 1-3" long and they are densely crowded with whorls of flowers. Each flower is up to ½" across, consisting of 5 petal-like sepals, 8 white stamens with pink anthers, a tripartite white style, and no petals. The sepals are white, sometimes becoming green toward the throat of the flower. 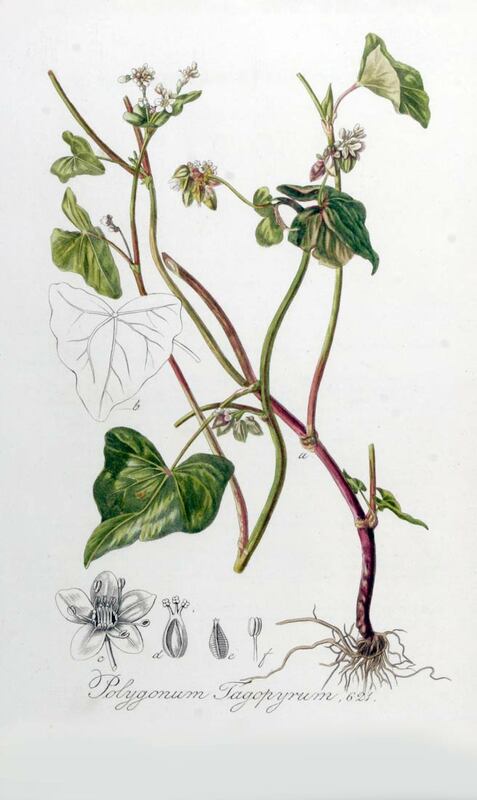 The outer surface of the sepals is occasionally tinted light pink, particularly on the flower buds. The blooming period occurs during the summer and lasts 1-3 months. There is a pleasant floral scent. Each flower is replaced by a winged achene with 3 sides. The membranous wings of this achene form a heart-like shape with smooth edges. To some extent, the achenes can be blown about by the wind because of their sizable wings. The root system consists of a taproot. The name 'buckwheat' or 'beech wheat' comes from its triangular seeds, which resemble the much larger seeds of the beech nut from the beech tree, and the fact that it is used like wheat. The word may be a translation of Middle Dutch boecweite: boec (modern Dutch beuk), beech + weite (mod. Dut. weit), wheat; or may be a native formation on the same model as the Dutch word. Buckwheat is native to central Asia, now widely cultivated in China, Russia, Canada and northeastern US. Buckwheat prefers to grow in full or partial sun and moist to mesic conditions. Buckwheat tolerates a variety of soils, including loam, clay-loam, light sand, and muck. This plant spreads by reseeding itself and can mature quickly from seed—it begins to flower at a small size. Buckwheat can be either direct combined or swathed and windrowed. For direct combining, a rough rule-of-thumb is to start combining when about 80 to 90% of the plant and seeds are brown. It is normal for buckwheat to still have a few green leaves, green seeds, and a smattering of flowers at the tops of the plants when combining starts. Although combining can be delayed until after frost, the frost can accelerate seed shattering and can make the stalks more prone to falling over (lodging). Buckwheat is a crop that should be harvested when ready, rather than letting it stand in the field for a long time. If swathed, buckwheat can be cut a little more green (when about 75% of seeds are brown), and allowed to ripen in a window for a few days before picking it up with a combine. At harvest time, buckwheat seed is usually sufficiently dry to be stored short term with no further drying, provided that green material is minimal in the grain. Store in a cool, dark place, in an airtight container. 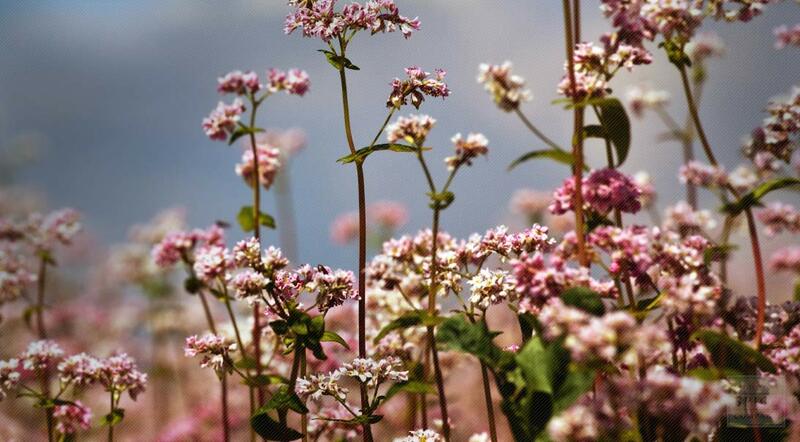 Buckwheat is a crop plant that has been cultivated	throughout the northeastern and central US since colonial	times, reaching a peak in the mid-1800s with a significant	decline in cultivation during the 1960s. Until the plant	gained popularity as a breakfast food in the 1970s, it was	largely grown as a foraging food for livestock and to	produce flour. When a USDA nutritional analysis of buckwheat	revealed a higher amino acid concentration than most	cereals, including oats, production of prepared buckwheat	cereal peaked. Cultivation also increased since the grain	was in high demand in Japan, where buckwheat flour is used	to make soba noodles. The flour is also used to make buckwheat pancakes as well as	several international variations, including the crepe-like	galettes in France and blinis (or blintzes) in Russia. In	Europe, buckwheat is the source of a cereal called gretchka,	more commonly known as kasha to Americans. This cereal is	also used as a thickening agent and to make rice, pasta and	yeast bread products. Combined with wheat or corn, buckwheat	may be found in the Italian style of porridge known as	polenta. Buckwheat hulls are considered desirable stuffing material	for pillows because there is less risk of exposure to	allergens than pillows that contain down (feathers) or	synthetic fibers. Pillows filled with buckwheat hulls also	conduct and reflect less heat than those filled with	synthetic materials. Used alone or combined with rice or	dried herbs, buckwheat hulls are ideal for making eye and	neck pillows to help ease fatigue and tense muscles.